There is a great wealth building tool you have available right now that will absolutely make you financially wealthy. However, it’s a wealth building tool most people don’t think about all that often. When most people think about tools for building wealth, they think about things like investment strategies, savings calculators, and building a good credit score. Some even believe that get rich quick schemes and playing the lottery are legitimate tools for building wealth. But in my opinion there is one wealth building tool that trumps all others. And there are a lot of wealthy people on the Forbes 400 list that agree with me on this one. 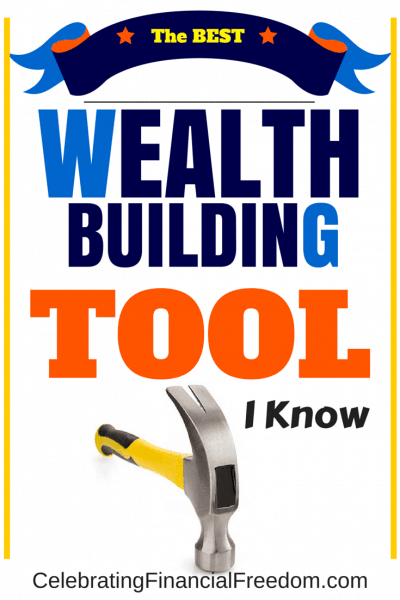 That wealth building tool is your income. It sounds so obvious but most of us don’t really understand it. Your income allows you to have a roof over your head, a car to drive, and food in your belly. The problem is that the majority of people are using all their income just to live. So many of us are living paycheck to paycheck, there's little or no money left over to save and invest. Obviously, you’ll never get wealthy living paycheck to paycheck. Get Control of Your Income- Make a monthly spending plan for your money and stick to it. Get Out of Debt- Debt is an income destroyer. Getting out of debt means you can save and invest even more money. Wealth building is so much easier when you have no debt. There is no shortage of people teaching that debt can be a great wealth building tool. You especially hear that from people who are trying to sell you a real estate investing program or get rich quick scheme. It’s true that you can use debt to build wealth. However, it’s a much riskier proposition and never works out as well as debt free investing. A lot of things have to go right when you borrow money to invest. But if just one or two things go wrong (such as a housing bubble or stock market crash), an investment that’s highly leveraged with debt will easily blow up in your face. In reality, debt (especially consumer debt) is an income destroyer. Debt siphons away your hard earned money in the form of interest and fees. This causes you to spend more on those things you buy using debt. In essence, that extra money you spend for the privilege of financing is a tax on your lack of planning and control over your money. Most people in America make enough money to be able to put money into savings and investments. Even if you have a low income you can save money if you are extremely diligent. However, a huge number of people save and invest little, if at all. The reason for this paycheck to paycheck lifestyle is because of debt. That’s why having complete control of your money and getting out of debt are extremely important to building wealth for the future. One of the best ways I’ve found to massively accelerate saving money to invest for the future is to find ways to make more money. Even a little extra income can make a huge difference in your wealth building when it’s allowed to grow over a number of years. Of course, I’m not talking about making extra income to use for spending money. I’m talking about making extra money that you put straight into savings and investments, in addition to the savings you take out of your primary income. When you sock away that extra cash every month and let it build over time, you’ll see your wealth grow quickly and exponentially in a way that just doesn’t happen with your regular income. Although making extra money to save and invest grows your wealth faster, it can still take a number of years to grow a substantial amount of wealth. As a society, we tend to be impatient. We want to see results now, without having to wait years for investments to grow into a large stockpile of wealth. But trying to get rich quick rarely works. When it does it usually doesn’t last. The best way to grow your money is with slow and steady effort over many years. In fact, this is how Warren Buffett, one of the richest men on earth built his wealth. He started investing with just a few hundred dollars, and 50 years later he’s worth over $60 Billion! Slow and steady wins the game! How Do I Make Sure My Income Is Working For Me? The best way to make sure your income is working hard and growing is to maximize it every way you can. Too many believe building wealth has to be fancy and complicated. But all it really takes to build wealth is to use the simple, uncomplicated techniques I mentioned above over a long period of time. Keep doing this, and when you get old and really need it, you will have more wealth than you ever thought you could! Question: Do you believe your income is your best wealth building tool? If not what do you think works better?